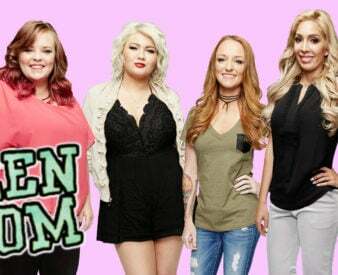 Anyone who’s watched Teen Mom for at least a few seasons has seen firsthand how cheating has torn apart many of the girls’ relationships. We’ve seen both sides of infidelity: even though many of the cast members had to find out the hard way their partners were being unfaithful, many of the girls themselves were the ones cheating! There doesn’t seem to be a surer way for relationships to come to an end, and it’s also a great way to make sure your former partner hates you forever. You’d think that the cast members may have learned their lessons by now, but apparently that’s not the case. Even after watching their co-stars ruin their relationships with cheating in the past, this cast member has just been busted for cheating… and dumped! Keep reading to watch a sneak peek of the next episode of Teen Mom 2! There’s nothing like cheating to end a relationship immediately. Learning that your partner has been unfaithful makes it incredibly hard to ever trust them again, and many people simply decide to end things then and there. The Teen Mom cast has seen serial cheaters repeatedly step out on their partners and get into hot water for it. But apparently this cast member hasn’t quite learned his lesson. What’s ironic is that Leah Messer’s ex husband, Jeremy Calvert, has already gotten caught up in a cheating scandal in the past… involving Leah Messer! Leah’s relationship with Jeremy overlapped with her relationship with Corey and T. R. Dues in some highly suspect ways, but apparently that’s not stopping Jeremy from stepping out on his new girl. Jeremy and his girlfriend Desi only recently started dating, but it seems that things are already taking a turn for the worse. But at the beginning, everything was looking up. “Road trips with babe…… #sohappy #grateful #shesamazing,” Jeremy captioned this picture of him and his new girlfriend, making their relationship Instagram official. According to her bio, Jeremy’s new lady is named Desi Kibler, and according to her picture, Jeremy has landed quite the looker! Since then, the two have been nothing but flirtatious across social media. In fact, they even hinted at getting married! In fact, things seem to be moving at record paces, even for Jeremy. Desi tweeted, “Hate leaving Jeremy, makes me appreciate him even more every time I’m with him.” She added, #timetostartplaninning, with emojis of a wedding ring, a house, and a family! WHOA! In fact, Jeremy was even willing to stay with Desi when she was busted for drinking and driving! According to Radar Online, Jeremy’s lady has had some trouble with the law. She was arrested for allegedly operating under the influence of alcohol on April 12 at 1:28 a.m. She was then charged with one count of OVI with blood alcohol concentration of .163, according to Radar, who point out that this is over twice the legal limit! She was also charged with possession of a controlled substance, and police found an orange and white capsule pill on her. But the story doesn’t end there. Desi was arrested, booked, and released…. And then arrested again in the same night! At 3:17 a.m., she was allegedly stopped and charged with another DUI, as well as driving under DUI suspension! Apparently this doesn’t bother Jeremy, because he quickly came to her aid. He paid a $500 bond for the first DUI charge and $3,500 for the possession of drugs charge, Radar reports. Desi pled not guilty to both cases, which are also both still active. Is it any wonder that fans are pessimistic about how long this relationship will hold up? “I would be so mad if I were Leah….Imagine your marriage falling apart and your ex hubby talking sh*t about you being on drugs on national television….and then he moves on to a chick who gets arrested twice in the span of one day for DUI and drug possession…” wrote user Boblazereth. A couple that can make it through an arrest can make it through everything, right? Well, apparently they can’t make it through cheating! Desi spilled the update on Twitter, and it’s obvious she’s not too happy. “I have a type,” Desi tweeted. “Faithful and trustworthy.” She added, “If you’re going to act single, then be single.” Even though Desi may have been blindsided by Jeremy’s behavior, fans were not. Fans were quick to notice that Jeremy also deleted all pictures of Desi from his Instagram… and then deleted his Instagram entirely! It looks like whatever went down between these two was not pretty. There’s just one more question: who did Jeremy cheat with? Even though Desi didn’t give those details out, fans have a theory that it’s someone we’re all pretty familiar with. Even though this may seem like wishful thinking, it’s certainly not a stretch to think that Leah and Jeremy could be on their way to getting back together. After all, Leah has recently spilled that she and Jeremy have been hooking up very recently.